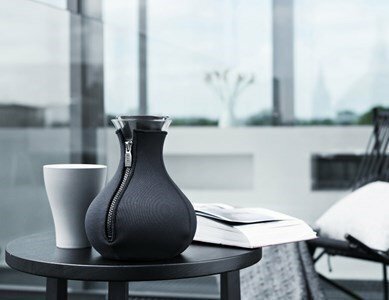 This kettle includes the Eva Solo's patented anti-dipping serving system, so that you can enjoy your tea till the last drop. Very practical and functional, it goes beyond of being just an object of pure design! The cover gives it an extra charm. Made of borosilicate glass, stainless steel, rubber and a cover, this kettle has a filter that will give that extra flavour to your tea. 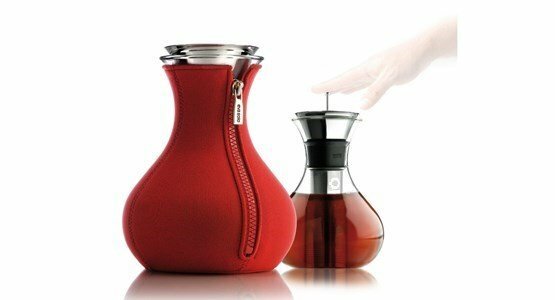 The cover keeps your tea warm longer, and avoids you from burning your fingers while pouring tea. Put the tea directly into the kettle, add boiling water ( for green tea, the water must chill at least five minutes before pouring in the kettle). Put the filter and let it rest for about 8 to 10 minutes. Put the filter in the kettle followed by the tea, and pour the boiling water slowly and gently.Put the lid on and let it rest for about 5 to 6 minutes. Quickly press the handle to stop the inffusion. Then let yourself enjoy the flavour and the scent of the tea. It's dishwasher safe, except for the cover. It must be washed by hand and with a neutral detergent.